This edited collection brings together the unpublished letters of the extended Clairmont family, for the first time. The letters, housed in the Carl H. Pforzheimer Collection of Shelley and His Circle at the New York Public Library, inform our understanding of the Shelley-Godwin circle through the experiences and thoughts of their descendants. The correspondence also enables us to see into the contemporary social history of nineteenth-century families living in Europe and Australia, dealing with subjects such as the conflicts in Europe, woes in the European financial markets, and the effects of Australian pioneer life on immigrants to that country. 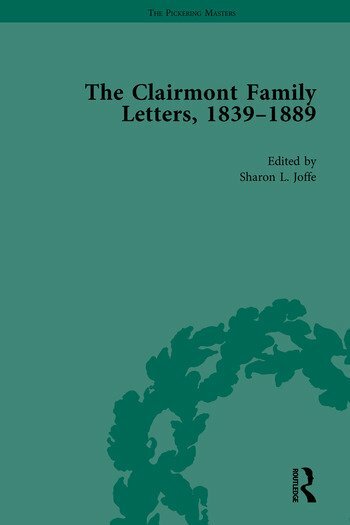 The Clairmont Family Letters, 1839–1889 improves upon scholarship made by other Shelley and Clairmont collections and is furnished with editorial notes and apparatus from Dr. Sharon Joffe. These volumes will be of significant interest to scholars in British Romanticism. Sharon Lynne Joffe was born in South Africa but has lived in the United States since 1985. She has a Master of Science degree in Education from the University of Pennsylvania, and MA and PhD degrees in English from the University of North Carolina at Chapel Hill. Sharon is an Adjunct Associate Professor at North Carolina State University. Her major area of teaching specialization is in nineteenth-century British literature. Sharon has also extended her research interests to include the field of Digital Humanities.